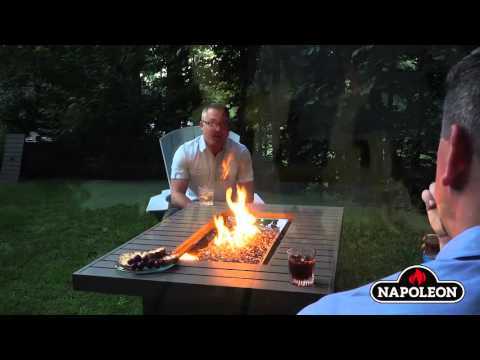 Free Gift w/ Select Napoleon Fire Pit Tables. For a limited time only, get a free glass windscreen with the purchase of select Napoleon PatioFlames fire pit tables. Free shipping offer. Enhance your outdoor living area with the Napoleon Kensington Square Patioflame Table. This 48-inch flame table is a perfect outdoor lighting option that produces 60,000 BTUs of heat in dancing flames. The handcrafted aluminum table frame is designed with durability in mind, and the Topaz Crystaline glass ember bed adds to the beauty of the fire. The thermocouple valve prevents leaks and wastage by cutting off the gas when the flame is disrupted, and the included lid allows you to easily transform your fire table into a functional table capable of entertaining a group of friends. This flame table includes a burner, burner cover, 7 1/2 lbs of topaz glass, table with easy access doors to store propane tanks, and a propane to natural gas converter. Table Size 48 X 48"
Napoleon Patioflame products have a three (3) year limited warranty against defects in material and workmanship for aluminum table tops and pedestals, stainless steel housings, and stainless steel burner assemblies. All other parts are warranted for two (2) years. Napoleon’s Patioflame series incorporates modern styling along with a rustic bronze finish on the handcrafted aluminum table frame. The Topaz Crystaline glass ember bed enhances the flames while the stainless steel burner produces up to 60,000 BTU’s of heat. Getting started is easy with the electronic ignition and the thermocouple valve keeps things safe by turning off the gas if the flame is ever disrupted. This fire pit table includes a burner, burner cover, topaz glass, and table with easy access doors to store propane tanks. All stainless steel components are covered by a 5 year limited warranty. Gas valves, thermocouples, igniters, and gaskets are warranted for 1 year. The Patioflame table comes set up for propane (LP) gas and comes with a propane to natural gas converter for those who have a gas line available. 48 X 48" 48 X 48" 47 X 47" 47 X 47"
23" 23" 20 1/2" 24"